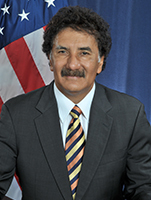 Commissioner Mario Cordero of Long Beach, California, was confirmed by the Senate to serve as a Commissioner of the Federal Maritime Commission beginning June 3, 2011. He was reconfirmed on October 8, 2015, for a term set to expire on June 30, 2019. President Barack Obama appointed him to serve as Chairman of the Commission on April 1, 2013. He served in that role until January 23, 2017. Mr. Cordero brings with him over thirty years of private legal practice and decades of public service � including serving eight years on the Board of Harbor Commissioners for the Port of Long Beach (POLB). Prior to serving at the federal level, Commissioner Cordero was very active in the Long Beach maritime community. While a POLB Commissioner, beginning in 2003, Mr. Cordero spearheaded the Port of Long Beach�s pioneering Green Port Policy, a policy aimed at reconciling economic growth and environmental stewardship to achieve long-term, sustainable port development. He also served as President of the Port of Long Beach�s managing body. Concurrent with his leadership positions on the POLB, Commissioner Cordero served on the Executive Board for the American Association of Port Authorities� (AAPA) Latin American delegation. In this role, he led efforts to develop policies for greater cooperation, increased trade, and joint growth across the combined North American and Latin American footprint. Under his leadership as Chairman, the FMC underwent monumental change and received accolades from Congress, the Administration, and, most importantly, stakeholders, for its attentive and careful approach to facilitating solutions to several paramount issues. These issues included concerns arising from container weight rules that affected cargo movement, new and unsubstantiated chassis fee proposals that affected the largest port complex in the United States, management of the PierPass program on the West Coast (designed to eliminate congestion and promote efficiency), and the international bankruptcy of South Korean carrier Hanjin. Notably, in March 2016, during his term as Chairman, Mr. Cordero was invited to testify in the United States Senate regarding the state of the United States maritime industry. In 2015, the FMC received an award for being the 2015 Most Improved Small Agency, as part of rankings released by the Partnership for Public Service and Deloitte. The rankings are based on data from the Office of Personnel Management�s Federal Employee Viewpoint Survey (FEVS) and provided rankings in 14 categories. The Commission achieved positive gains in all categories, the most significant being in Effective Leadership (Empowerment), Strategic Leadership, Training and Development, and Support for Diversity. The recent 2016 FEVS results again indicate increased employee satisfaction. In May 2014, he was the recipient of the Stanley T. Olafson Award, presented by the Los Angeles Area Chamber of Commerce to individuals who have advanced world trade and international relations. On September 29, 2015, Mr. Cordero accepted the Connie Award from the Containerization & Intermodal Institute, given to those who have contributed to the evolution of the containerized shipping industry. Further, in February 2016, he was named Person of the Year by the New York/New Jersey Foreign Freight Forwarders and Brokers Association. Finally, in August 2016, Mr. Cordero received the prestigious Malcom McLean Award from the Association of Bi-State Motor Carriers, given in recognition of his efforts to be inclusive, encourage open dialogue on key issues affecting intermodal commerce, and put forth forward-thinking initiatives, which facilitated progress and partnership amongst the stakeholders at the Port of New York & New Jersey.